Merle E. Storck, age 90, of Farina, Illinois passed away at 2:38 p.m. Sunday, August 12, 2018 at HSHS St. John’s Hospital in Springfield, Illinois. Funeral service will be at 11:00 a.m. Thursday, August 16, 2018 at St. Peter’s Lutheran Church in St. Peter, Illinois. There will be a two-hour viewing prior to the service. Reverend Ryan Meyer will be officiating. Burial will be at St. Peter’s Lutheran Church Cemetery in St. Peter, Illinois. Memorials may go to St. Peter’s Lutheran Church, Lutheran Care Center or the donor’s choice. Merle was born on December 24, 1927 in Fayette County, Illinois, the son of August Herman and Rose Katherina (Engeljohn) Storck. He married Frances Lillian VanSant on April 7, 1950 at the United Methodist Church in Farina, Illinois. He was a member of the St. Peter’s Lutheran Church. He played on the St. Peter softball traveling team for many years. 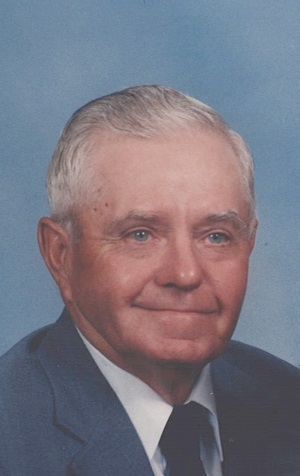 He enjoyed hunting, working with his bird dogs and spending time with his family and friends, especially his grandchildren and great-grandchildren. He is survived by his two sons, Keith Storck (wife Jody) of Farina, Illinois and Kevin Storck (wife Joyce) of Farina, Illinois; daughter, Becky Niehaus of Salem, Illinois; 8 grandchildren, Derek Storck (wife Melissa), Kevin Niehaus (wife Katy), Dustin Storck (wife Cara), Amy Lipe (husband Brian), Katie Lotz (husband Corey), Chad Storck (wife Amy), Clint Storck (wife Erica), Ryan Niehaus and 12 great-grandchildren. He was preceded in death by his parents, August and Rose Storck; wife, Frances Lillian Storck; brother, Earl Storck and three sisters, Helen Stock, Selma Quade and Leona Wolff; four brothers-in-law, Harold Quade, Edgar Wolff, Richard Stock, Seibert Hoover and sister-in-law, Rosalie Hoover.